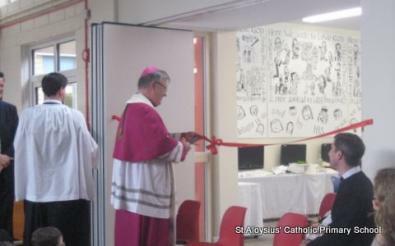 St Aloysius' School had an exciting day on Tuesday when Bishop William Kenney celebrated our feast day Mass at the Oratory and then officially opened the new courtyard building. The School Council gave a splendid presentation about the new motto and Mission Statement (see the text of these below) and the music group played beautifully to entertain the guests at lunch. "Be ambitious for the higher gifts." 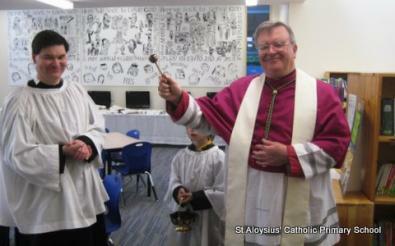 At St. Aloysius' we learn to grow in holiness, to become who we were made to be. Here we seek to know God, finding Him in all that we learn, and understanding that all that is good, beautiful and true offers us a glimpse of God. Here we seek to love God, with our hearts, our minds and our souls, meeting Him in prayer and recognising Him in one another. Here we seek to serve God, making the best use of our gifts to serve those around us. Here, recognising God's delight in us, and by His grace, we become more fully alive. The School has a new website which you can visit here.